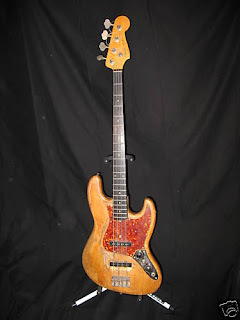 The Guitar Column: Jaco Pastorius' Jazz Bass On eBay! Ok. Let me sit back and take a deep breath. This is pretty amazing. Apparently, Jaco had a unique arrangement with owners who had basses he liked -- he would set them up according to his personal preference and come around to play them whenever he was in the vicinity. And there were several such basses around the country -- which probably helped since Jaco was often known to be without an instrument having hocked it for various reasons. 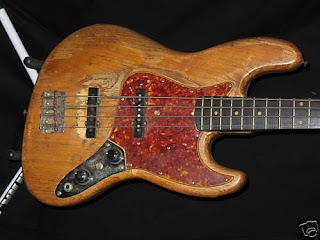 And according to no less an authority than Mark Egan, Jaco liked this particular bass so much that he wanted to make it a fretless, but the actual owner declined any such modification. Egan, who knew Jaco well, actually played a Jaco-modified fretless bass, a gift from Jaco himself, on the first Pat Metheny Group album. I'm really digging the heavy thumb-wear over the bridge pickup, worn well into the wood. You can almost smell the mojo. For many bass players -- and for some of us guitar-playing Jaco fans -- this is akin to discovering the Holy Grail, the Shroud of Turin, the Dead Sea Scrolls or a Hendrix Strat. Now if this bass could only talk..
once in 1977 in Buenos Aires , Argentina, met jaco cause i was the only guy speak english relative ok, to do a funny deal with cocaine, just i was request for a friend to help with the language,at that time i study music and to meet jaco was weird , almost impossible to believe my eyes, he was a tall guy and long hairs (to e in the jazz rock scene)looks more like a hard rock musician that every thing else, so after helped with the language i talk to jaco a few minutes, he was happy and overexited, and i took the chance to ask if i can looks at his bass, he say NO PROBLEM !! and bring a strange coffer with 2 fender basses(at that time i had 17 years old)i ignore he got 2 basses always i guess he have a fender fretless,so..he open this extra large case and inside have the 2 fender basses invertd head to body,both basses was in one case custom made,i look at those and he catch the one i ask(fretless )and passed to me ...i got a sensation very rare cause i think i never could take it.i grab the jazz bass and play a bit over and i pas back to him few seconds later and he say test thats is more easy (cause the freths had been there)what inever forget was the freted was more worn then the other one.but both was (to me at that time)kind of destroy...paint around the edges has been gone and u can see the wood.neck was dark in between 3rd and 10nd freth, and very scratched the back of the body.i did some pictures and was so happy to see him in person and in the same time so sad to see a man so hooked in drugs. with my more deep respect to him and all whom love jaco pastorius. Hi, exiting story ...can you post the pics you made?